(The above is probably of average length). While the effect of this was not substantially different to that of this is not a novel, I still found it eerily hypnotic and absorbing. 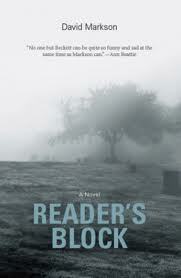 Early in the novel Markson mentions “Reader and his mind full of clutter” and he has said that “the intellectual odds and ends are meant to convey a portrait of what’s in his mind.” Certainly they have a cumulative effect, playing off each other and the Reader’s questions about the novel he will create. Their power can be particularly seen when we come to the final few pages: as with this is not a novel, it has emotional impact, while at the same time confirming the novel’s medium as essential to its message. Yes, and all the better for that. This year seemed the perfect opportunity to become acquainted with the experimental American writer, David Markson – or at least with his writing, Markson having died in 2010 (something not entirely irrelevant to this book, deeply concerned as it is with mortality). Everything I had read about him made him sound worth tracking down, from his early parodies of pulp fiction to his later move towards experimentation (in his fifties), as well as the admiration that other American writers such as David Foster Wallace clearly had for him. It was particularly difficult to resist such a provocative title as this is not a novel, originally published in 2001 and reissued last year by CB Editions. “Henry Miller died of cardiovascular failure. While these make up the majority of the novel’s pensees, we are also offered non-fatal anecdotes (“Salvador Dali once gave a lecture on London while wearing a diving helmet. And nearly suffocated.”), unattributed quotations (“I gotta use words when I talk to you.”) and comments that one artist has made about another (“Plato talked too much, Diogenes said.”). While the information provided cannot be said to be random – it all connects to the creative life – neither could it be said to present a coherent view of that life, apart from, of course, making the point rather emphatically that all artists must die. How does this work? Well, there is no doubt it works thematically, directing the reader towards the creative process (the Writer’s musings on what kind of work he is producing) and the creative life, particularly the relationships between artists. The apparently more than five hundred deaths mentioned cannot help but have an emotional resonance, referencing, as they do, both mortality and immortality (the way in which artists live on after death). “Or was it nothing more than a fundamentally recognisable genre all the while, no matter what Writer averred. About an old man’s preoccupations. Danger rating: certainly not for fans of plot, and unlikely to be adapted into a film, I still found this a book I didn’t want to stop reading. You are currently browsing the archives for the David Markson category.